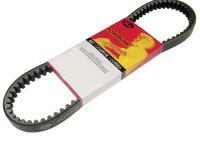 Gates PowerLink Premium Drive Belt size 641-15.5-30. Fits Honda Elite SA50 (49cc) 1990-2001, Honda Elite LX SR (SA50) Daelim Cordi, and others. suitable for all purposes for scooters, quads and ATVs. Dimensions: 641*15.5*30 Suitable for Daelim Message 50, Message II 50, SE Cordi 50, Tapo 50 (99-00), Honda GP Dio 50 (91), SP 50 Dio, Dio SR 50 (90) and Dio ZX 50 (94-00) scooters. 23100-GZ50030 / 23100-SE50030 / 23100GR1753 19/32" x 25 1/4"